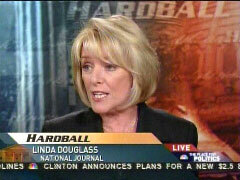 According to Marc Ambinder of theatlantic.com, former ABC News Capitol Hill correspondent Linda Douglass, also a former correspondent for CBS and NBC News, will be leaving her position at National Journal to join the Barack Obama presidential campaign as a senior strategist. Ambinder quotes Douglass: "I see this as a moment of transformational change in the country and I have spent my lifetime sitting on the sidelines watching people attempt to make change. I just decided that I can't sit on the sidelines anymore." Ambinder's article, which can be seen here, further describes Douglass as having grown "disillusioned with the partisanship she saw first hand" during her journalistic career.